The leaves have changed color, the temperature has dropped and there’s no denying that the holidays are upon us. As you plan to gather for celebrations with friends and family, one thing that can most certainly ruin your holiday cheer is the thought of being stuck in traffic. Luckily, there’s a better way to get to Sacramento – the Amtrak San Joaquins! Taking the train removes the stress from your holiday travel experience. You can skip the long TSA lines, bags are free, and there’s plenty of legroom. 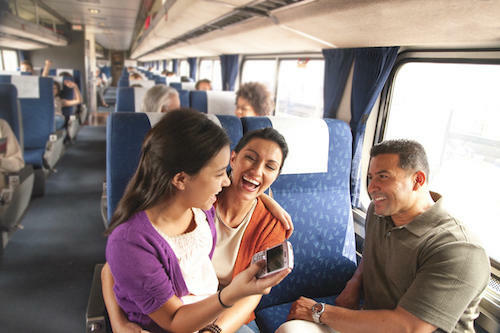 Once onboard, not only is there free Wi-Fi , but the Amtrak Connect server offers you free entertainment – magazines, videos, and information on local discounts. Whether you’re a college student, senior, or traveling with a group there’s a discount for you to get to Sacramento. Booking at least two days in advance allows you to use the Friends and Family discount - purchase one ticket at full price and receive up to five more tickets 50% off! With the money you save on fares, you can treat yourself to an extra museum day or splurge on one of Sacramento’s many Farm-to-Fork offerings. Did you know that the Amtrak San Joaquins service reduces CO2 emissions by over 24 million pounds? You can breathe easy knowing that taking the train is the eco-friendly choice. Spend less time worrying how you’ll get here, and more time getting excited about all that Sacramento has to offer. Book your ticket at www.AmtrakSanJoaquins.com, by calling 1-800-USA-RAIL or downloading the Amtrak app.